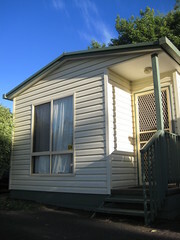 I just got back from a 4-day mini-holiday in the Victorian countryside. My brother-in-law had a teaching job in Ballarat and another in Horsham so he decided to bring the whole family. This is the first post of a series about our trip to Ballarat, The Grampians and Horsham. 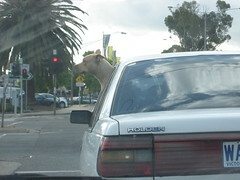 We started out late, leaving Melbourne at 6 o’clock in the afternoon on Sunday. Ballarat is a little over 100 kilometers from Melbourne, and driving there takes about an hour and a half via the Western Highway. Though it was a Sunday, there were plenty of people on the road. Probably families headed for their country homes or students enjoying their holidays (and their new licenses). I’ve always loved driving (or in my case, riding) around Melbourne and the outlying countryside because of the great condition of the roads, and the seemingly lack of traffic. Australia is almost the same size as mainland USA, but unlike the United States, the population of the entire country is only at 21 million (Metro Manila has about 11 million residents). This means less people in the streets, less people on the roads, just less people, period. When I first came here, I told my sister I’d love to drive in Australia, since the roads are pretty empty. She was quick to refute my argument, saying that it’s much more dangerous here. Emptier roads meant people tend to drive faster. The higher the speed, the higher the chances of a car crash, which in Manila would just mean bumping the car in front of you. I realized what she meant, when I saw a car grazing the rear bumper of another on the road to Ballarat, during the first trip we made there last February. We were driving along the side road, looking for a fish and chips shop to buy our picnic lunch. As we wait at the intersection for a break in the traffic to go back into the main road, one car going over 100km/h grazed the left rear end bumper of another car going over 90km/h. The first car only swerved a bit, but the second car tipped to the side. Luckily for the driver, the car didn’t topple over and soon righted itself. The driver only got some minor bruises and possibly some broken bones. Now on our second trip to Ballarat, there was another accident along the freeway. We didn’t actually see it, but it was a bit unnerving to hear about it, seeing as we passed the same stretch of road just minutes before. According to the reports, four teens were inside the car that careened of the highway, hitting a tree by the side of the road. The car burst into flames upon impact. Police and witnesses says that the car must have been travelling at 160km/h. 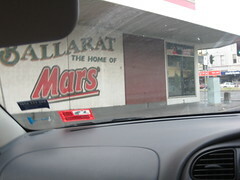 Road accidents aside, it was great to drive back into Ballarat. I greatly enjoyed the time whe spent there last February, albiet a short one. There were no concrete plans for this Ballarat trip, just a stop at the local Rivers branch, where we went shop crazy and bought a trunkload of shoes (well, just half, really) during our last trip. Another highlight was to check whether Lake Wendouree has dried up again (it was completely dry last February and almost full at the end of July). After a drive around the city, we emerged from one side street, right across our home for the next two days, Lake Wendouree Tourist Park. Coming up next: our day in Ballarat, review of Lake Wendouree Tourist Park, and driving off to our next destination. Do you love the gentle scratching of a pencil on paper or the smooth glide of a ballpoint? Share your most unforgettable travel experience, and get a chance to win a Lonely Planet travel journal.